When 3CDC first began developing the 359-space Mercer Commons Garage in 2012, they defended their actions for building such an over-sized garage by saying they would share the spaces with other planned nearby developments. Nearly three-and-a-half years have passed since that time, but it is now becoming clear that 3CDC has largely lived up to the promises they made at the time. When first criticized by UrbanCincy, 3CDC noted that the spaces at the Mercer Commons Garage were meant not only for the $50 million Mercer Commons development, but also the office space at the Paint Building, Cintrifuse, and former Boss Cox building. In total, 3CDC’s former Vice President of Development, Adam Gelter, estimated that those projects alone would need 90 to 100 spaces. In addition to that, 3CDC’s previous plans for the former Smitty’s site called for 30 to 40 residential units, which would also have their parking provided for at the Mercer Commons Garage. Since that time, those plans have evolved, and 3CDC is now proposing a 55,000-square-foot office and retail building, which, by law, would require 155 parking spaces – much more than would have been required under the previous residential scheme. City officials say that a potential 77-space reduction may be permitted due to the existence of the nearby Mercer Commons Garage and Washington Park Garage, which have an availability of 141 and 14 spaces, respectively. Should 3CDC pursue to utilize those two garages to their fullest extent, then it would be feasible for the non-profit development organization to avoid providing any parking at all in the $16 million project slated for the southwest corner of Fifteenth and Vine Streets. In addition to being located to two nearby parking garages, this site is directly across the street from a Kroger grocery store, located a block away from the Cincinnati Streetcar’s first phase, and within blocks of several Red Bike stations. 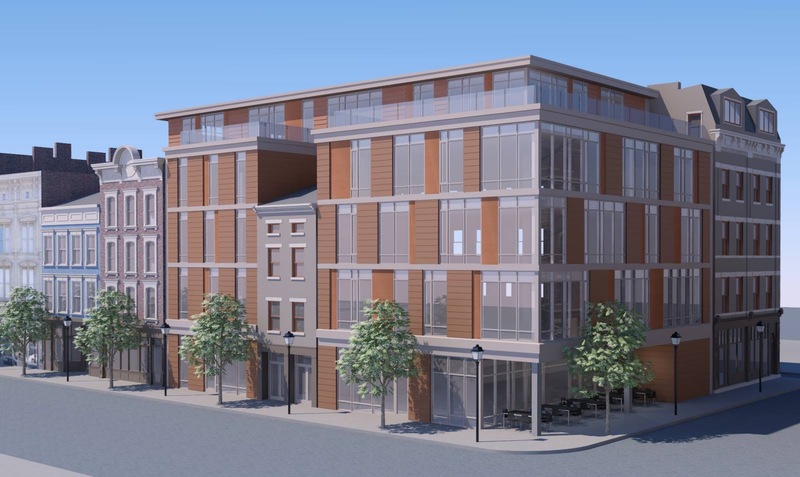 With a Walk Score of 96 out of 100 points, the proposed unnamed development at Fifteenth and Vine Streets boasts one of the most walkable locations in the region. If all goes according to plan, and 3CDC is granted their zoning variances by City Hall, then project officials say they hope to begin construction as soon as possible, with a project completion scheduled for mid-2017.